If you haven't used Maven to help build your projects before, this overview will cover configuration, commands, POM files, and the Maven lifecycle. 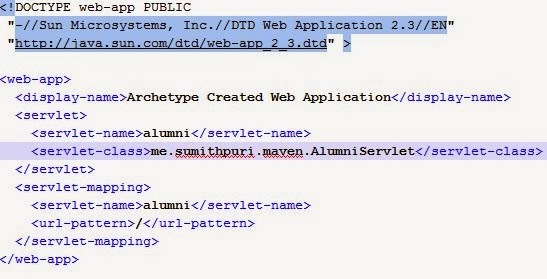 I have created an alumni project that is a dynamic web archive with a Servlet that says “Hello, Alumni”. First, download Apache Maven 3.2.5. Next, set the path variables for M2 and M2_HOME. You must additionally set Maven in your path as follows. Now run the mvn archetype:generate command from the place where you want to create a web project. Start off with this command to download all templates from the Internet. This has to be used initially so that all known project templates can be downloaded to the local system. It will prompt you at the end of a successful execution of this command for a number. Enter the number 529, which is used for ‘maven-archetype-webapp’. Make sure that you have an Internet connection — otherwise, you will not see all the archetype listings. Maven Archetype is a templating toolkit that is provided along with Maven. If we now try to build the project using ‘mvn compiler:compile’, we will get the following errors because we have not added the dependent JAR files for Java Servlets. We can add the dependent JARs so that the project can compile. We can do so in the pom.xml – The explanation for how Maven will download this JAR to the local repository and the details of the POM (Project Object Model) are provided later in this blog. Use ‘mvn compiler:compile’ to compile the web application. Modify the web.xml to add the Servlet using the following configuration. Use ‘mvn war:war’ to package the web application. Note: Make sure you rename the default index.jsp to index.bkp to render the Servlet output. Maven provides a simple and extensible way to compile, build and deploy applications and allows us to manage the total build life-cycle of applications. The following are known as the maven coordinates (the ones that are the most important) for any project. The most important lifecycle stages or phases for a Maven project include the following. Validate: Validates whether the project coordinates and pom.xml are valid, or else it generates errors. Compile: Compiles the project and generates errors if it cannot be compiled. Test: Unit tests the code and does not require that the code be packaged. Package: Packages and generates the artifact, such as a JAR. Install: Installs the generated artifact, such as a JAR in the local repository. Some of the plugins include JAR, compiler, and surefire. An example of a Maven command is as follows: mvn compiler:compile. The Maven project is compiled; it checks in the local repository for dependencies. If dependencies do not exist, Maven downloads them from the remote repository. Once dependencies are downloaded, they are installed in the local repository. Once all dependencies are met, Maven compiles the code and the project. Maven is able to achieve dependency management through the existence of Project Object Model or pom.xml files within each of the modules. At each module level, we can provide a pom.xml that contains the build environment information, build settings information, dependency relationships between POMs, and general project information. Also, there is a concept of inheritance and effective POMs (where the effective POM is a resultant of the inheritance hierarchy). Located inside the Maven installation is a Super POM (pom.xml), usually in the maven-model-builder-<x.y.z>.jar files, which is the under the %M2_HOME%\lib\ folders. This contains the details that all other modules’ POMs inherit from. This also contains the location of the remote repository, which is, by default https://repo.maven.apache.org/maven2. It usually has four main sections – central repository details, plugin repository details, build details, and plugin management details.